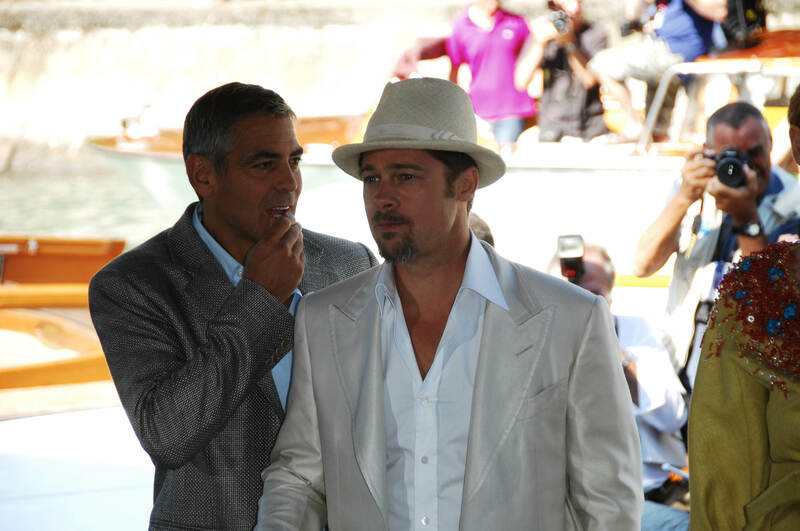 George Clooney has his hand on his chin at the Venice Film Festival, while Brad Pitt wears a white suit and a matching white hat. 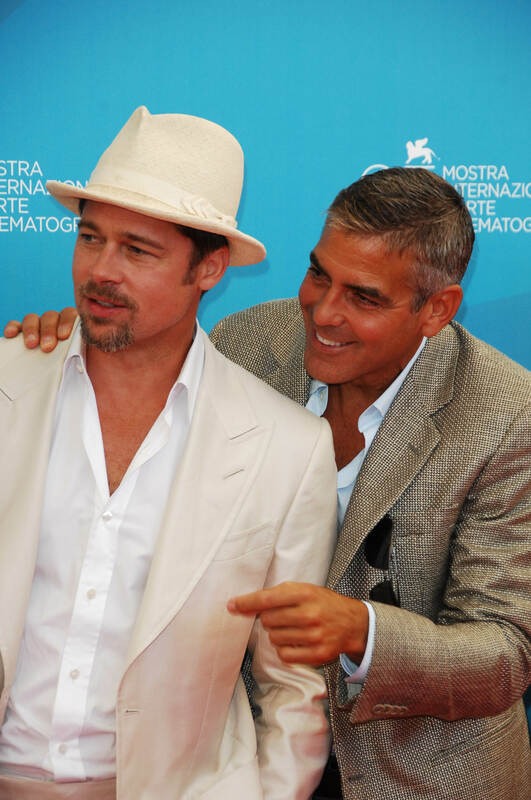 George Clooney has his arm around Brad Pitt at the Venice Film Festival while pointing with his left hand. 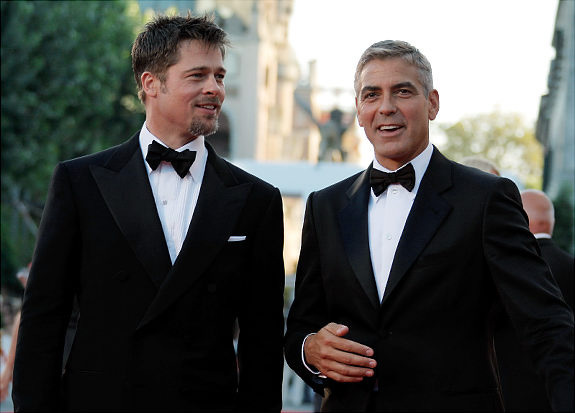 Both dressed in black and white tuxes at the Venice International Film Festival, Brad Pitt and George Clooney can be seen laughing. 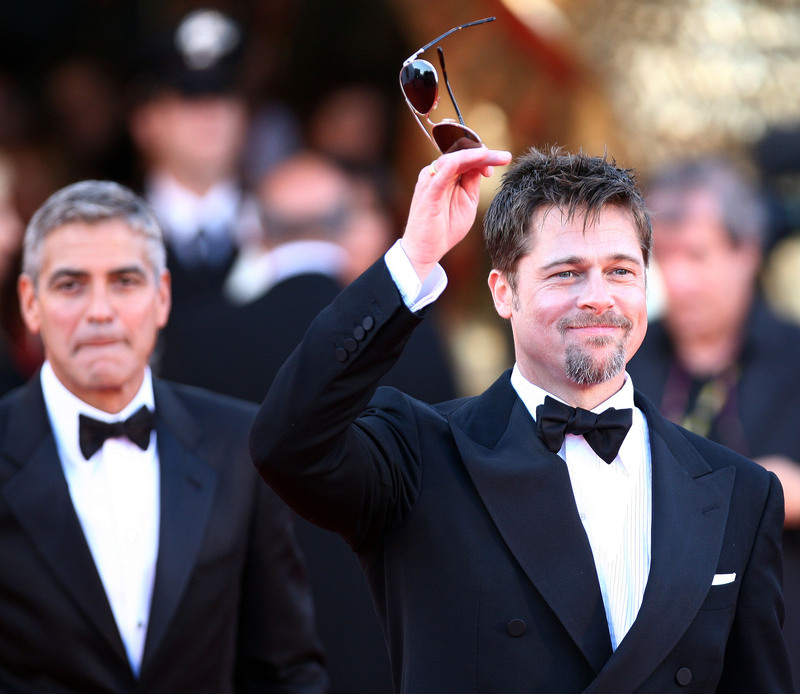 Brad Pitt and George Clooney are at the 65th Venice International Film Festival. 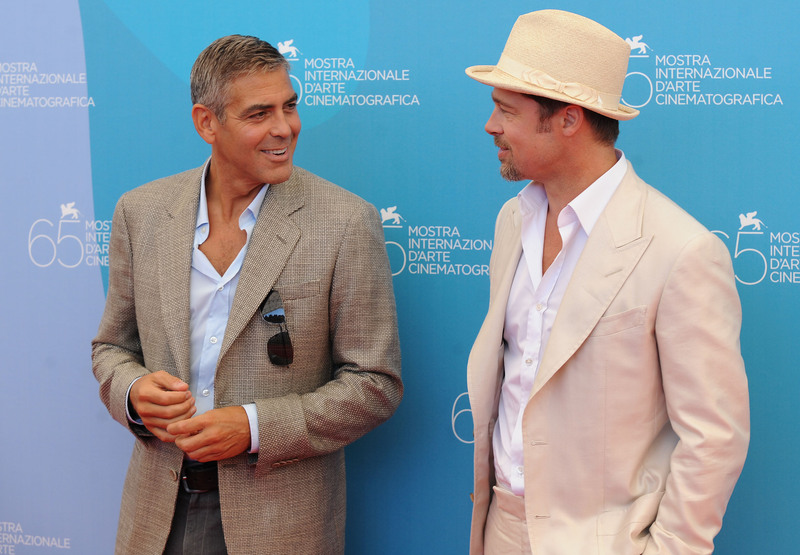 At the Venice International Film Festival, Brad Pitt and George Clooney look dapper. George Clooney, Tilda Swinton and Brad Pitt start laughing at the 65th Venice International Film Festival. Brad Pitt stands with George Clooney and Matt Damon at Grauman’s Chinese Theatre. George Clooney and Brad Pitt get dirty at Grauman’s Chinese Theatre when they put their hands in cement. Both wearing light colored suits, Brad Pitt in sunglasses smiles next to an onlooking George Clooney at Gauman’s Chinese Theatre. Brad Pitt hides his face as George Clooney holds a mic and talks about him at Gauman’s Chinese Theatre. From the movie Ocean’s Thirteen, George Clooney and Brad Pitt sit at a table. 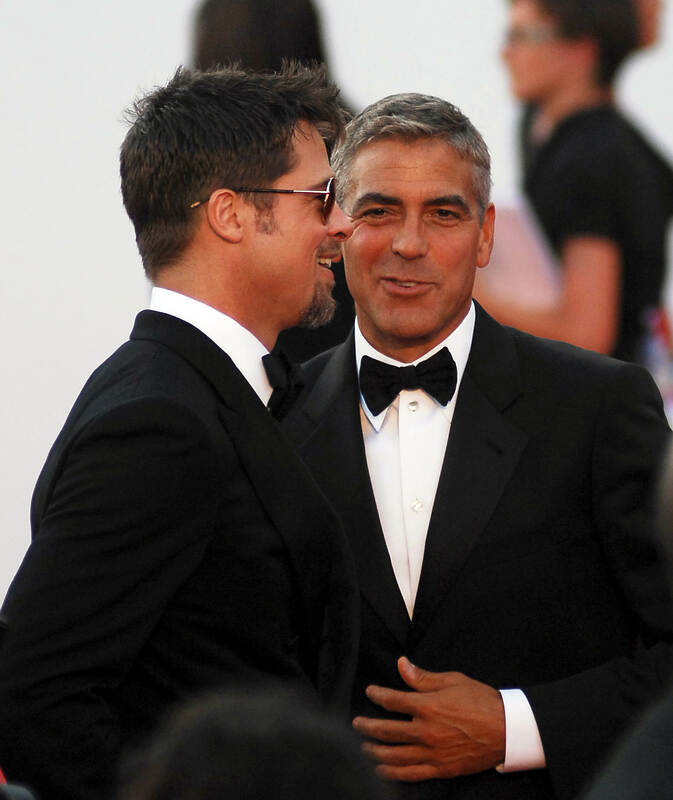 George Clooney and Brad Pitt smile at each other as they are both dressed in black tuxedos at the Venice Film Festival. Angelina Jolie is wearing a yellow dress while walking down a set of stairs with Brad Pitt and George Clooney at the Venice Film Festival. 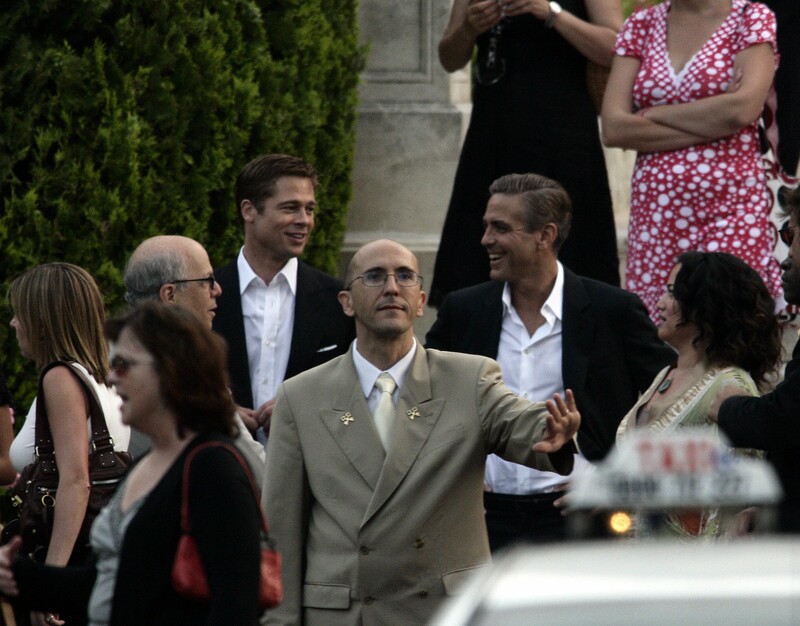 At the 65th Venice International Film Festival, Brad Pitt looks smooth as he stands next to George Clooney. Clooney has a big smile on his face. Brad Pitt and George Clooney pictured from behind at a Film Festival. Photographed from behind at the Vencie Film Festival, George Clooney is wearing a gray-ish suit, while Pitt has a darker suit. 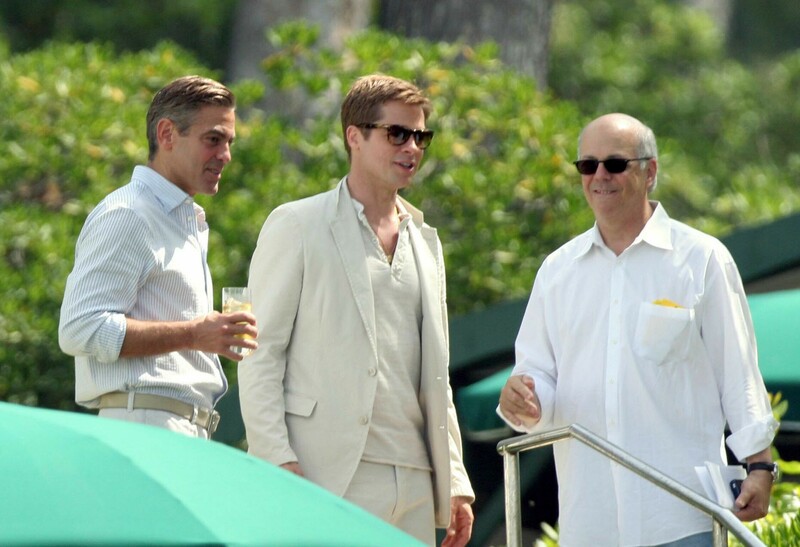 Both wearing white, George Clooney carries a glass as he and Brad Pitt stand by the railing while vacationing in France. 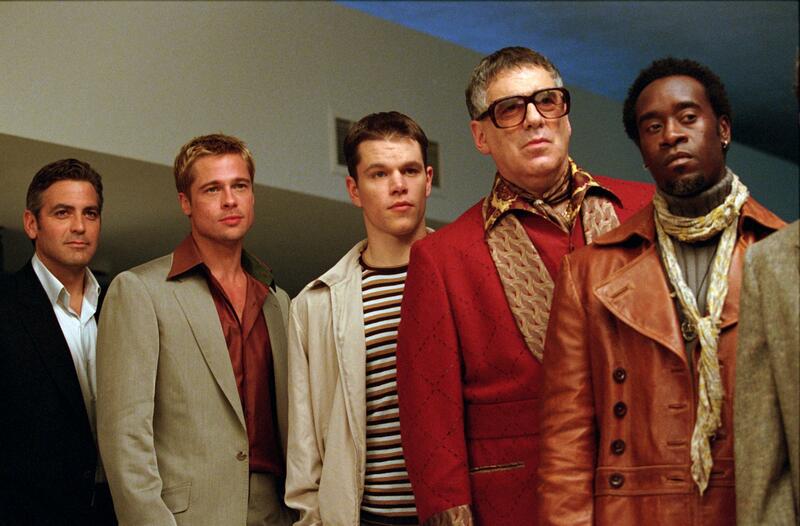 Wearing similar outfits in Venice, George Clooney and Brad Pitt walk down a set of stairs. Brad Pitt has his shirt off as he stands on a boat next to George Clooney as they vacation. 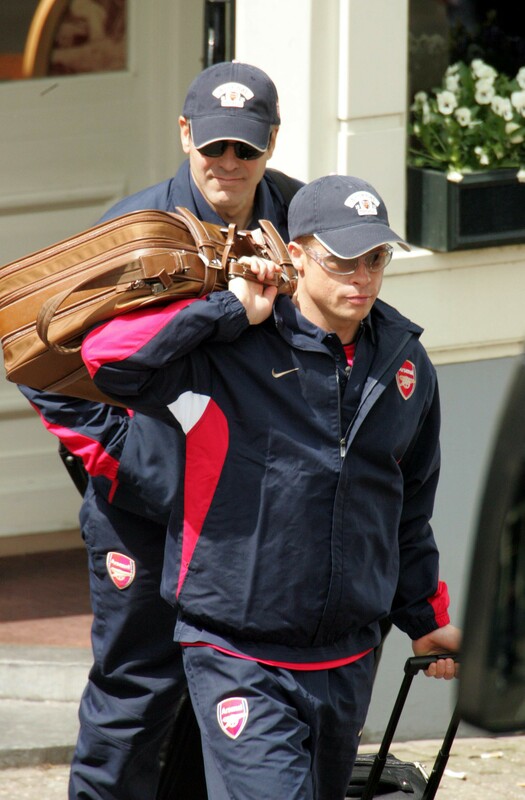 Carrying luggage and wearing the same sporty outfit, George Clooney and Brad Pitt are pictured. Brad Pitt wears a leather jacket and has his hand on his chin while standing next to George Clooney at an Ocean’s Thirteen premiere. 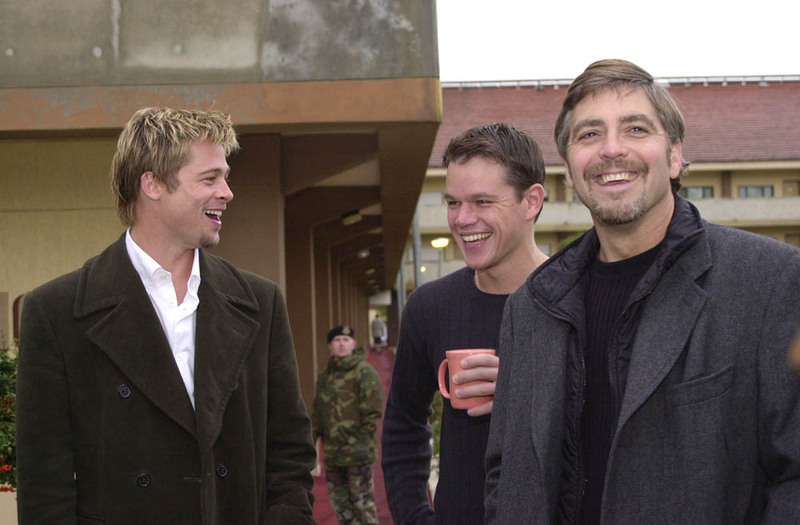 Matt Damon carries a pink cup while he smiles with Brad Pitt and George Clooney while they visit an U.S. base in Turkey. 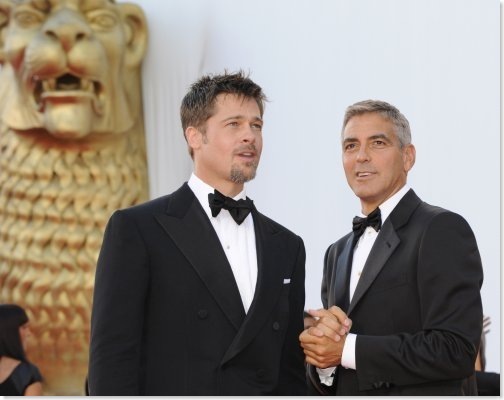 Standing in front of a golden lion in Venice, Brad Pitt and George Clooney wear tuxedos. 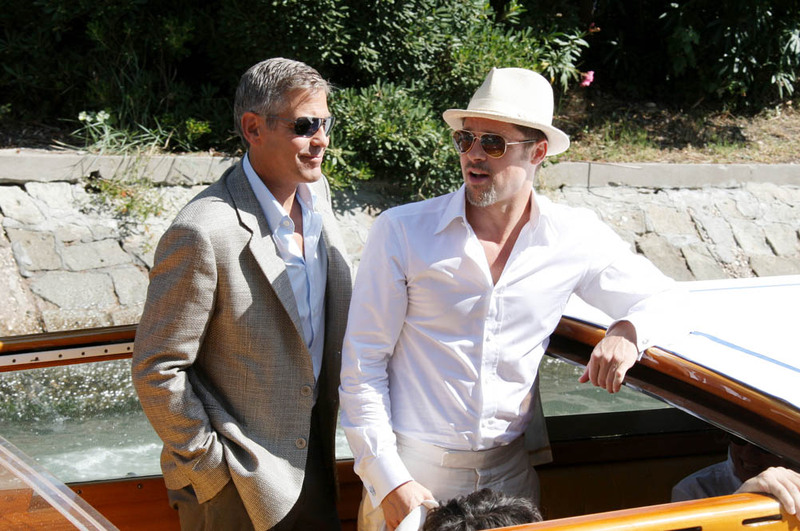 George Clooney has his hands in his pockets while standing next to Brad Pitt while they were in Venice. 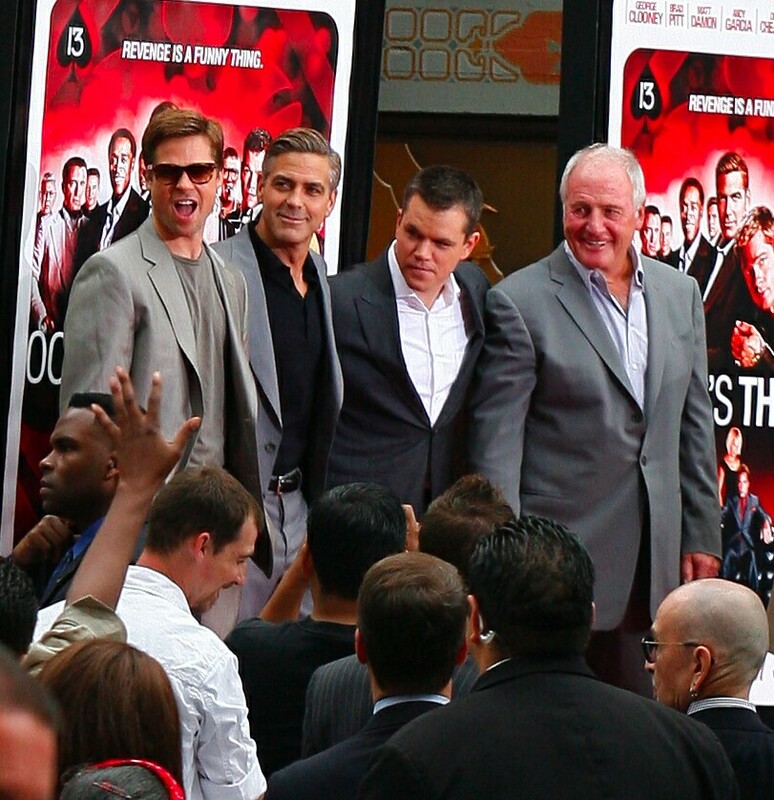 Brad Pitt is in the middle while Angelina Jolie talks with George Clooney at the premiere for Ocean’s Thirteen. 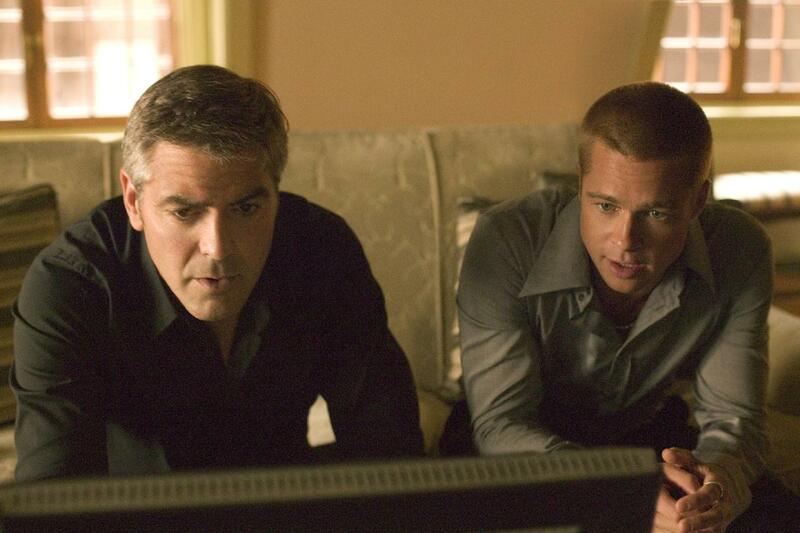 George Clooney and Brad Pitt in Ocean’s Thirteen, both wearing dress shirts, look closely at a television.